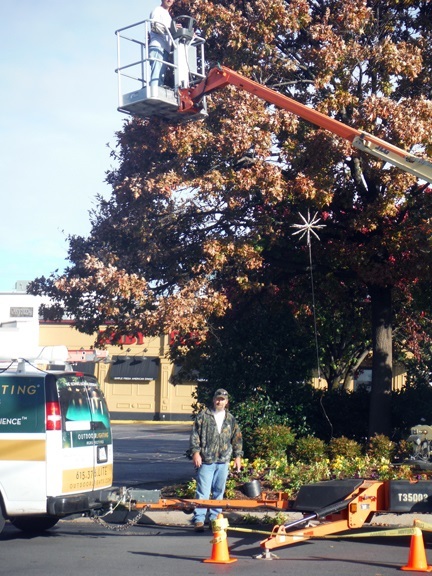 Our trained installers placing the lighted starburst onto the trees which line the entrance to the Mall at Green Hills in honor of the holiday season. The time is quickly approaching when Nashville residents will be out in full force doing their holiday shopping. 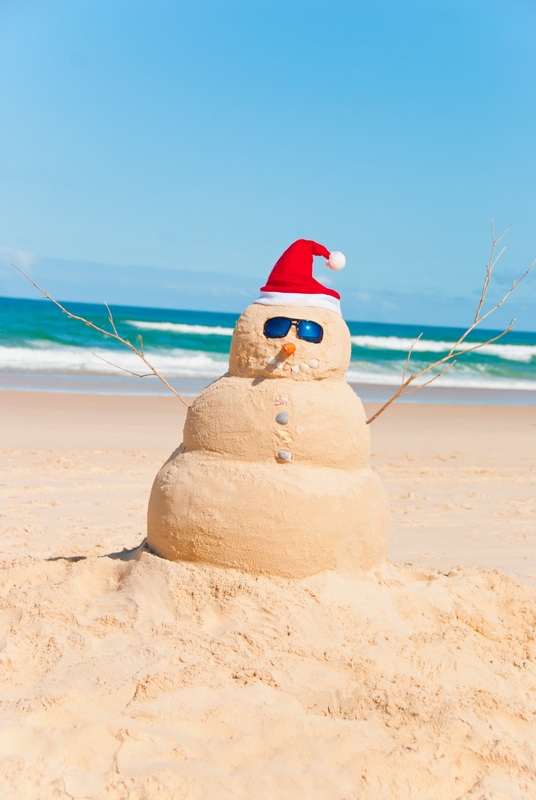 Maybe you have already begun gathering the items on your holiday gift list for friends and family this season. While you are out and about during the holiday shopping season have you ever really thought about how the decorations and holiday lighting on display affects you? What would the holidays be like void of any remnant of holiday cheer as you stroll from shop to shop making your selections? The answer to this question is just that, void. 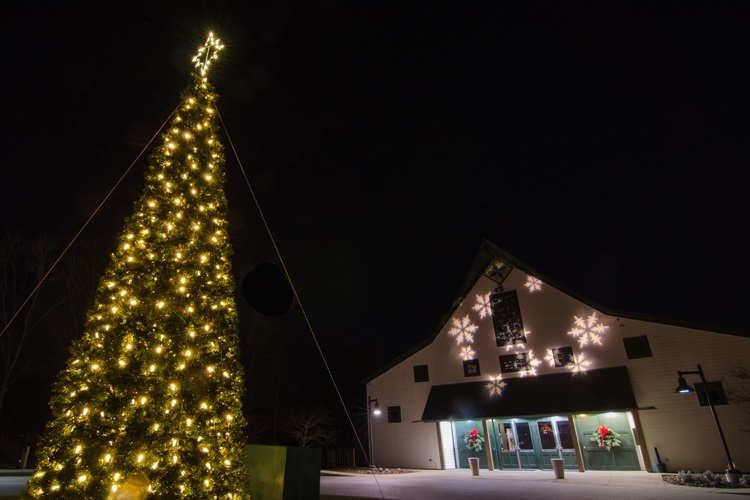 Holiday lighting results in visitors that are excited and their ‘sense of place’ is established upon arrival to a venue and is reinforced inside. 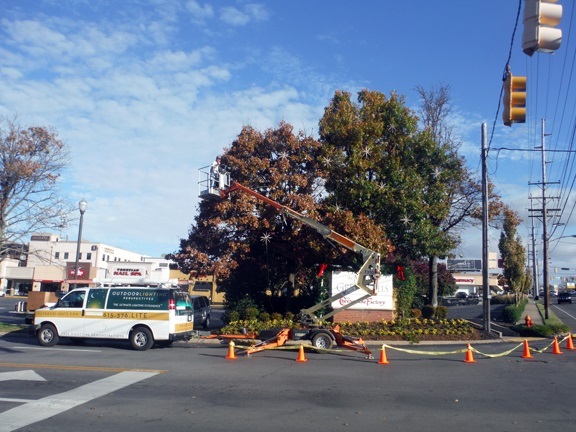 Another view of the holiday lighting installation at the Mall at Green Hills in Nashville. According to research, holiday decorations bring in earlier holiday shoppers to stores and keep them shopping longer. This same data showed that spending for 2012 picked up dramatically during the 4th quarter. This is usually the norm for most retail business to accrue a large percentage of their sales during this time. 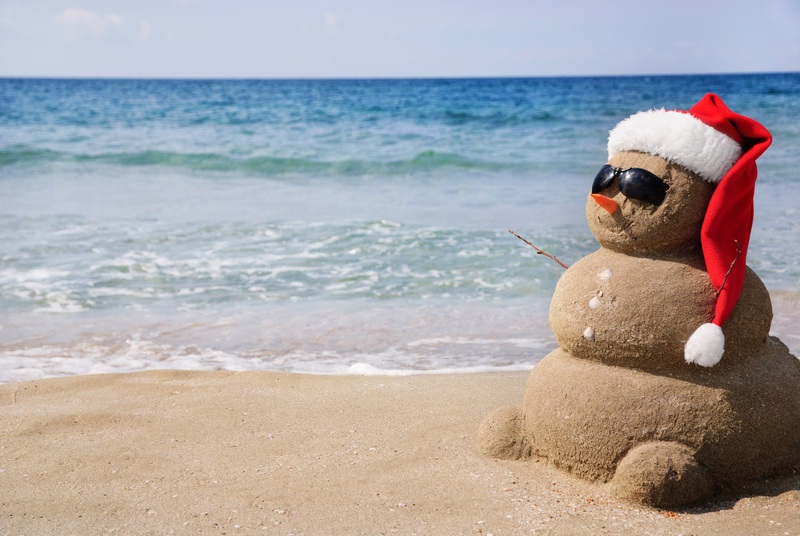 Holiday time is the most fruitful time of the year for many businesses, including restaurants, food and beverage stores and even sporting goods stores, just to name a few of the areas that feel the impact of 4th quarter sales. 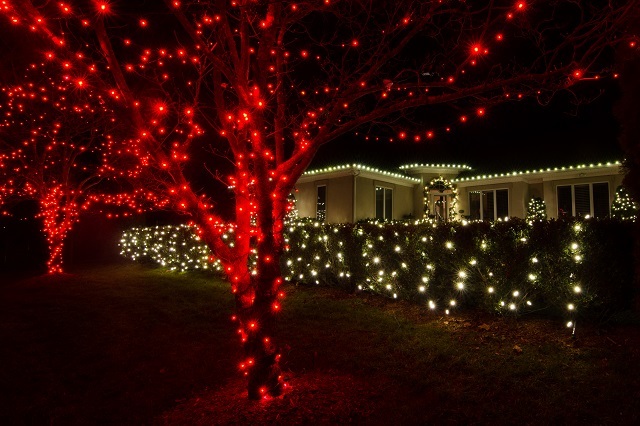 With all this in mind, now is the time to make sure your holiday lighting display is in order. You don’t want to wait until the last minute. Beautiful lit starbursts and 120 strands of mini LED lights will grace these majestic trees for the holidays. Another example of our commercial holiday lighting which shows the diversity behind our designs. 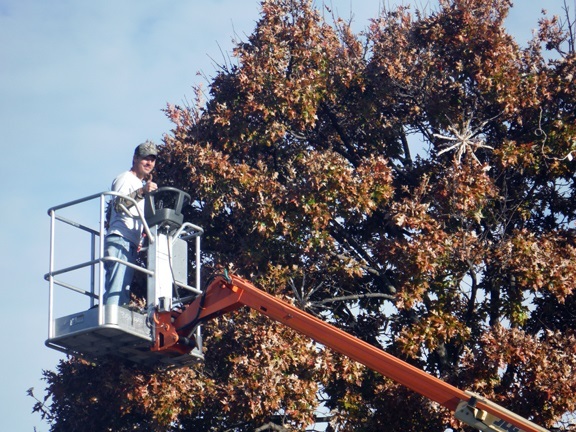 Outdoor Lighting Perspectives of Nashville makes commercial holiday lighting easy, hassle free and unforgettably beautiful. After all a bright, happy, and inviting storefront makes you stand out against the competition. 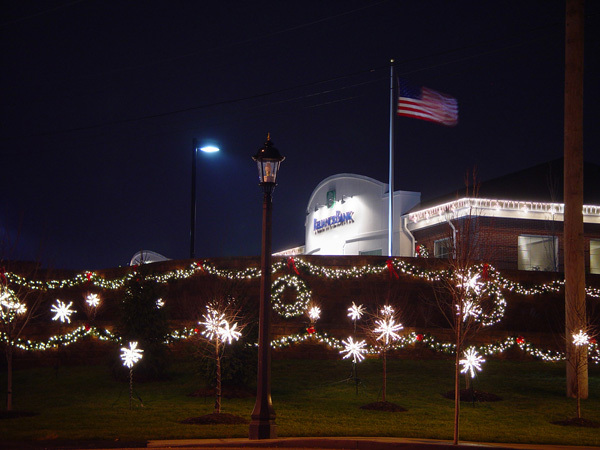 Many of our commercial holiday lighting displays are completed using super-efficient and eco-friendly LED lights. We plan, design, order, install and take down the lighting display for you with our all-inclusive holiday lighting package- you won’t have to lift a finger. 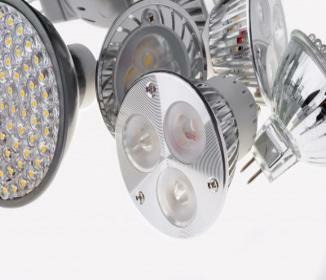 These lights will be stored for you for use the following year after being taken down and stored in our temperature controlled warehouses, so you don’t have to “clutter up” your store room. 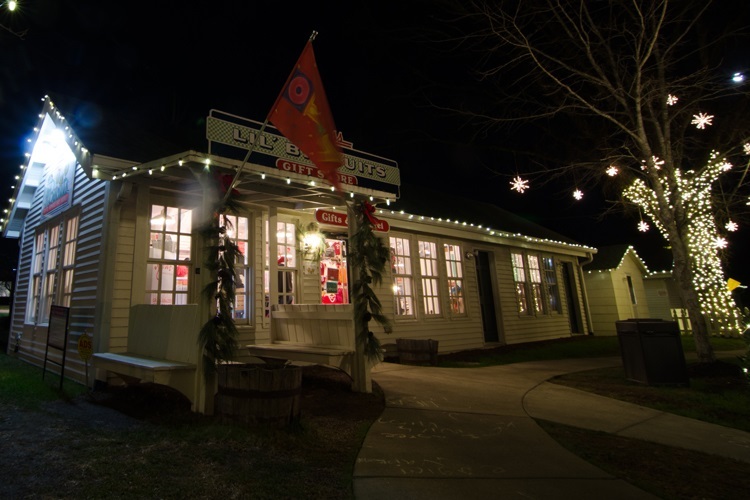 Unlike other holiday lighting companies, we offer property managers and shop owners something a little different – we design, install, and store. You don’t have to do anything. You literally don’t ever have to touch the lighting. Maybe you have seen our signs around town? 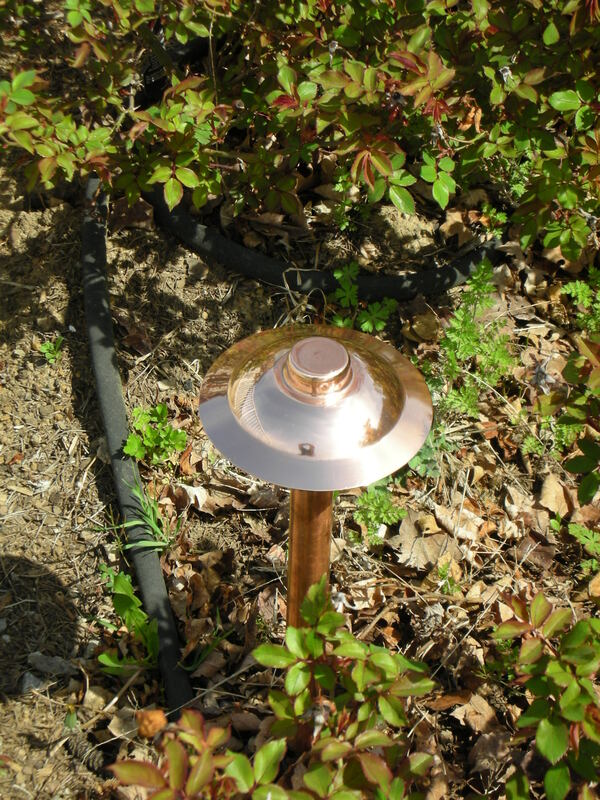 A lot of my customers ask me about how I design outdoor lighting. Next to relationships with customers, it’s my second favorite part of my job. To some extent, I feel I should keep this a secret because I don’t want to work myself out of a job. 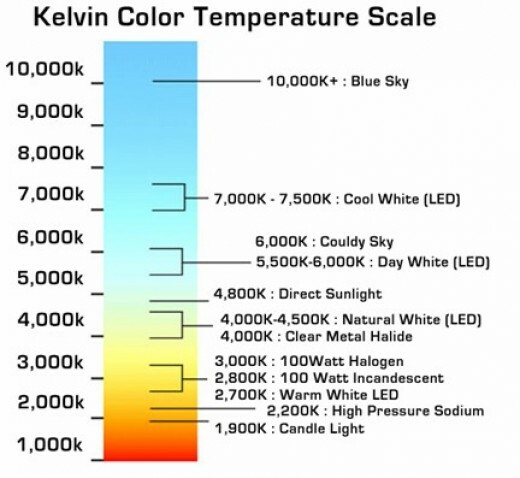 But, I also know although absolutely critical, lighting design is just part of an outdoor lighting job. Without professional knowledgeable installation, high quality fixtures and expert maintenance, the design would be moot. So, here is the first in an ongoing lighting design series. Every day I work with prospective business and homeowners to design outdoor lighting for their homes, landscapes, outdoor living areas and buildings. I had an interesting design consult this week with a hotel. 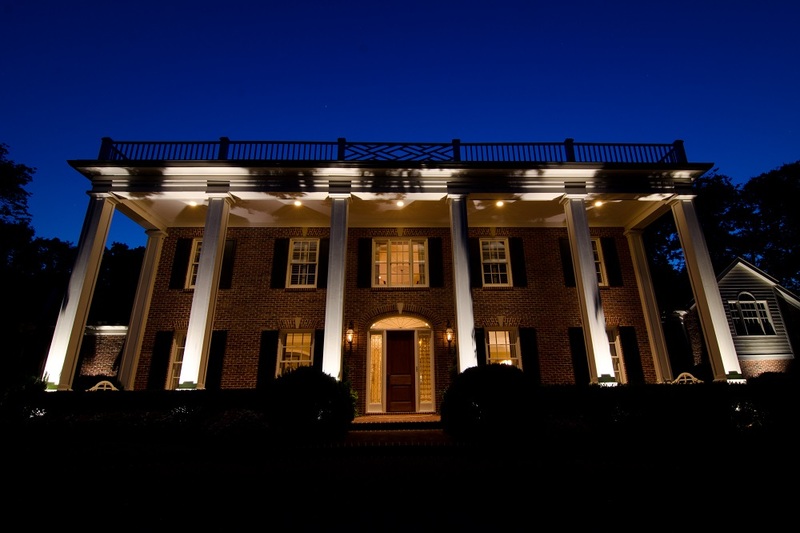 The owner’s primary motivation for outdoor lighting was to gain more visibility from the highway. 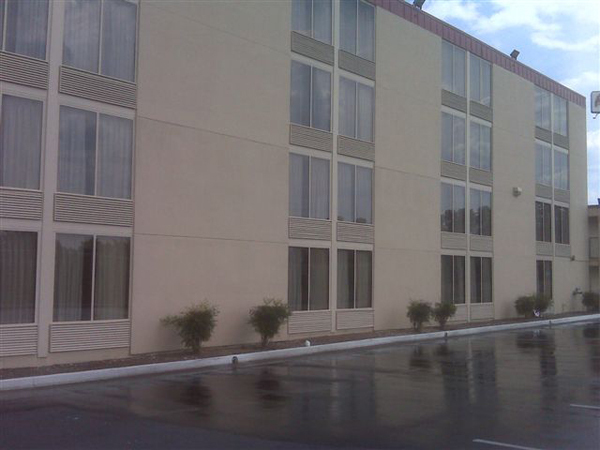 Here’s a view of the side of the hotel that sits on the highway. You can see that along the top of the building there are commercial outdoor lights that point down onto the parking lot for parking safety. But those down lights don’t illuminate the structure. 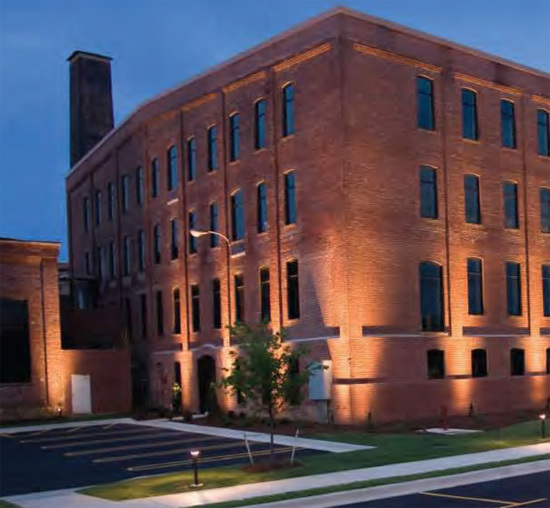 One idea that might come to mind is shining commercial grade spot lights at the facade to light it up like the 4th of July. 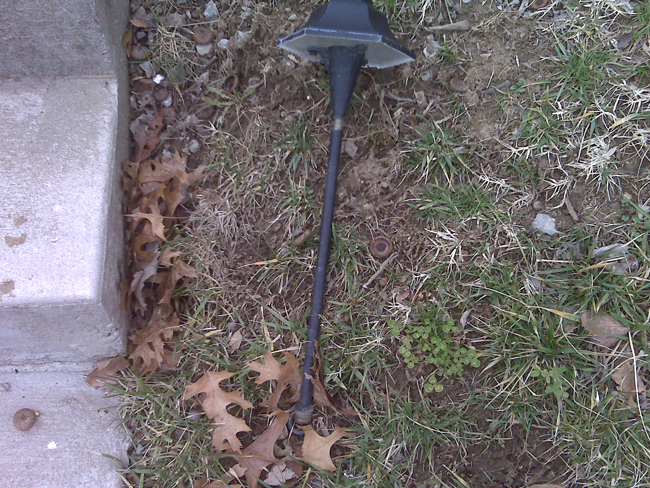 The problem with super bright spot lights is the feeling they create – viewable but “blown out”. A structure looks blown out when the light becomes the focus instead of the structure it’s illuminating. The other problem with flood lights is they obstruct the vision of the hotel guests. 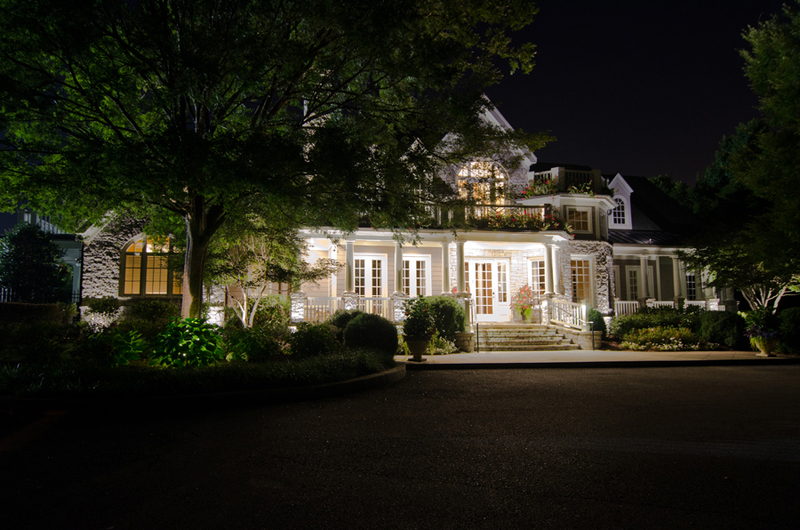 When you shine a generalized and bright light toward a facade, this creates a blinding effect to the guests who are looking out the window at night. So what we want to do is use lights near the base of the building the shine upward but specifically not light under the window columns. These are the architectural breaks. The architectural breaks are the vertical lines, if you will, created by the architecture that lend themselves to illumination. So on this facade, that would be the concrete areas between the windows and of course the left and right edges of the building. I always want to light the far left and far right side of the structure to give the structure breadth. 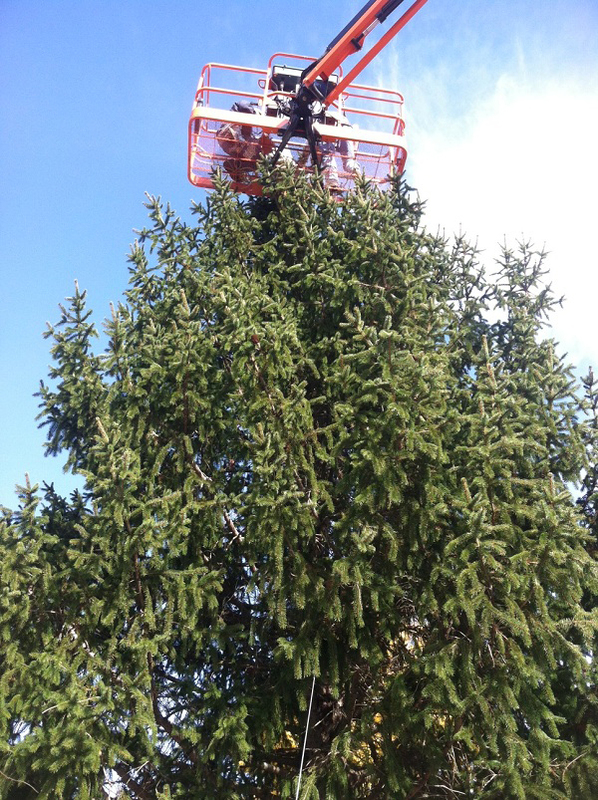 Here’s a picture of a job we did in Nashville. I love to look at pictures of commercial and residential applications and give some design ideas. Please feel free to comment on this post or email me pictures for ideas. Or give a call to the office and ask for me 612-620-2847.